Andy Alligator's Fun Park is perfect for birthday parties that are easy to plan and a blast to attend! 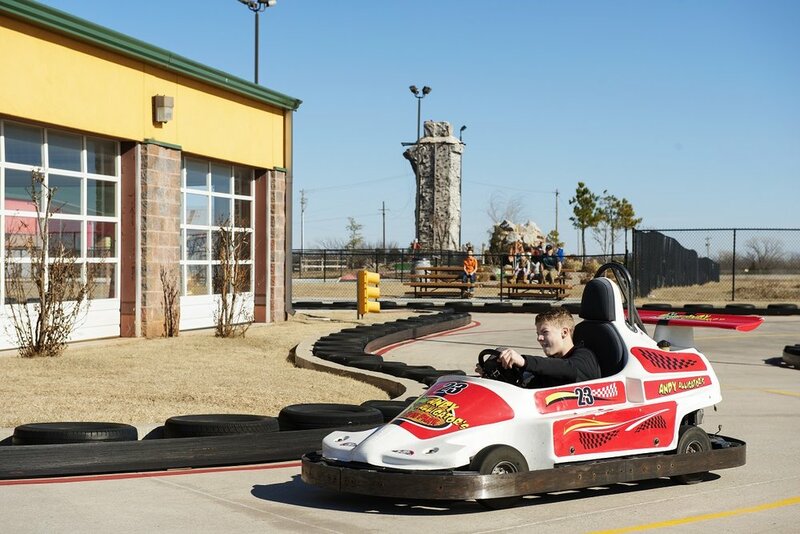 Race your friends on the Speedway, and hit a home run in the batting cages. Enjoy all the fun only after feasting on some freshly made pizza from Andy's Café & Pizzeria. NEW! Upgrade your party to a GLOW PARTY for just $29.99! 3 hours unlimited miniature golf, climbing wall, go-karts, frog hopper, laser tag, bumper cars, and Kidz Zone (Height Restrictions Apply). All-day unlimited wristband for the birthday child! Only $379.99 for up to 8 party participants, $37.95 for each additional participant. Celebrate your birthday and have a splashing good time at Oklahoma's newest family fun destination! The all-new Andy Alligator's Water park is perfect for birthday parties that are easy to plan and super fun to attend. Challenge your friends on the mat racer, chill in the lazy river, or get a gator-zillion gallons of water dumped on you at our giant play structure. Book your party today before time runs out! Party check-in sheet required to be filled out upon arrival. All parties require a $50 deposit. $379.99 for up to 8 party participants; including birthday child. $37.95 per additional participant. Birthday child spins the birthday wheel for a chance to win a bike!